You may already be aware of my 2 Dozen Fiesta Roses Giveaway ($120 Value) - Winners Choice that ends on July 18th. I have some EXCITING news for all those who have entered and those of you who still have time to enter! In addition to the beautiful rainbow, purple and blue roses... 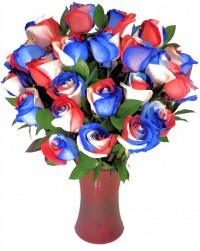 The winner now has the option of choosing their NEW Red, White & Blue Roses! Be sure to click HERE to enter! !